Lincolnshire Police and Hemswell Cliff Parish Council are pleased with progress after crime rates have dropped. Hemswell Cliff Parish Council have praised the work of Lincolnshire Police for helping bring crime under control in the area. Crime rates in the Hemswell Cliff area have halved between May 2018 (60) and June 2018 (30), according to latest figures published by Police UK. Lincolnshire Police have also confirmed a drop in crimes for July. Inspector Nigel Key, Neighbourhood Policing Inspector for West Lindsey, said: “Following a significant increase in the police resources dedicated to the policing of Hemswell Cliff since the beginning of June, we have seen significant reductions in the amount of anti-social behaviour being reported and these figures are continuing to fall. “In May 2018, 68 reports were phoned in to the force control room, compared to 28 in July. “This is against a back drop of the start of the school summer holidays, where traditionally we expect to see an increase, making these figures even more encouraging. “We are continuing to work closely with other agencies in tackling the core problems on the estate and provide diversionary activities during the summer holidays for the young people who live there. 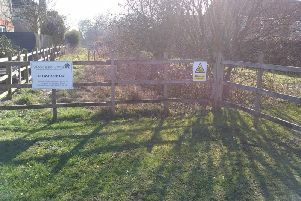 Hemswell Cliff Parish Council chairman, Coun Graham Prestwood, says he feels the situation has improved. Coun Prestwood said: “We now have a dedicated police officer, which I think has helped. “He is stationed here and is onsite for about 80 per cent of his shift - this is a great effort from Lincolnshire Police. • The Rasen Mail first spoke to Coun Prestwood at the end of May after a gang of ‘feral kids’ were terrorising residents in Hemswell Cliff. According to Coun Prestwood, gang members were smashing windows, jumping on cars, starting fires, throwing metal bars and vandalising property.